Speaker Gloria Macapagal-Arroyo will convene the House Oversight Committee on Disaster Management to look into the possible expansion of the Iloilo City flood control project and addressing the perennial flood problem in Passi City, Iloilo. PROJECT INSPECTION. 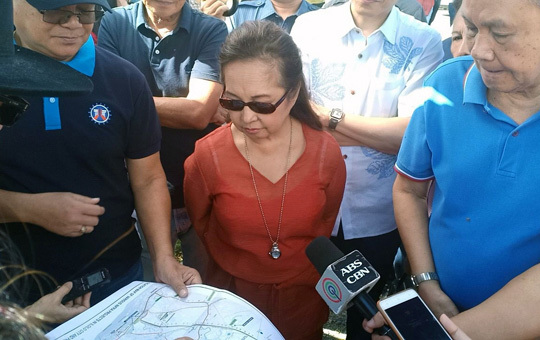 Speaker Gloria Macapagal Arroyo conducts an inspection and was briefed by DPWH officials on the condition of the Iloilo City flood control project in Barangay Buhang, Jaro, Iloilo City, a project she implemented during her presidency. The project eradicated the perennial flooding problem in Iloilo City and which has since became a game-changer in the development of the city. This developed as Iloilo local officials expressed gratitude to Speaker Arroyo for “fighting” to implement the flood control project that has brought progress to the city and the whole province. Arroyo has been in Passi City and Iloilo City since Sunday to attend various events. At the sidelines of the ocular and briefing of her Iloilo City flood control project in Barangay Buhang, Jaro, Iloilo, Arroyo said she will convene the House Oversight Committee on Disaster Management to try to address the perennial flooding in Passi which is caused by the overflowing of its three river systems. She said the same oversight committee will also look into the possible expansion and improvement of the flood control project she implemented in Iloilo City. Arroyo said she will look into members of the committee who are not running or running unopposed to conduct the hearing. “I do not want to get in the way of their campaign. If I don’t find anyone who is not running or running unopposed, I will chair it myself,” she said. Arroyo had said she will continue the conduct of oversight hearings during the recess to make sure the laws passed in Congress are property implemented. Meanwhile, Iloilo City Rep. Jerry Treñas said the flood control project implemented by Speaker Arroyo’s when she was president in 2003 has saved lives and property since it has eradicated floods that has caused so much damage in at least 60 percent of Iloilo City. “Before the floodway and the flood control project of Speaker GMA, we were always flooded whenever there were heavy rains. There was no development and people were always suffering. When this was completed, there was no more flooding and there was massive development in our city,” Treñas said. Accompanying Arroyo were Iloilo Governor Arthur Defensor Sr, Trenas, Passi City Mayor Jessry Palmares and DPWH and barangay officials. The P5.5B Iloilo Flood control project consisted of the construction of the Jaro Floodway, improvement of the Tigum and Aganan Rivers. The project also included improvements of the Jaro River mouth, the Iloilo River and Upper Ingore Creek. The whole project was completed in 2011. Arroyo said Iloilo City’s flood control project was initially rejected by the NEDA because of supposed lack of financial return. But she overturned NEDA’s decision and ordered its implementation. “I am an economist. I knew the project’s importance to the people of Iloilo City and so I overturned the NEDA. I am glad that it has so much positive change in Iloilo City and its people,” she said. She has been going around the country to visit her favorite projects during her presidency to check on their condition and to help in case something else needs to be done.